Maps are one of the oldest devices for telling stories. This fundamental concept seems to have been reinvented in the online realm as web maps provide a canvas for integrating a range of multimedia with maps as well as providing interaction to support user engagement. The ability of a map to invite a reader/user in and provide them with a rich, immersive environment is core to good map design. Web mapping extends the possibilities by providing additional ways to interrogate data. 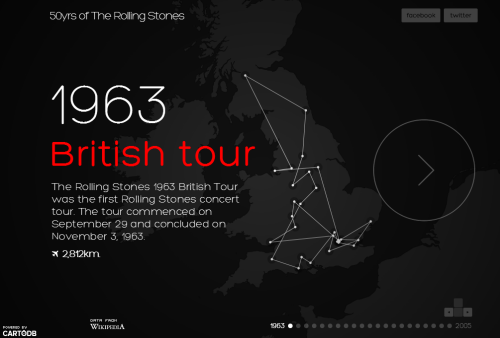 Here, a simple dataset of all locations of the touring history of The Rolling Stones is mapped. The map itself is stripped of virtually all detail. The colours are limited to a few greys with the splash of highly contrasting red used to great effect in the typographic components. As the user ‘turns the page’ to reveal each tour year the map shows cities and the links between them; location labels are only revealed with a mouse over (not a click!) so they don’t clutter the image. Useful navigation tools are minimalist but intuitive. Simple story. Simply presented with simple but highly effective design. This entry was posted in MapCarte and tagged interactive, MapCarte, story telling, web map by @kennethfield. Bookmark the permalink.